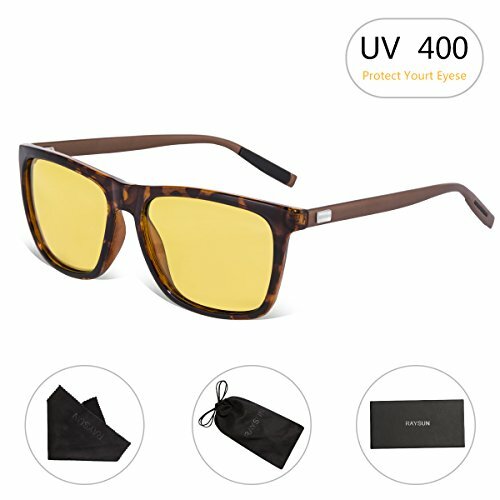 POLARIZED YELLOW LENSES - Provide reduced glare for clearer vision while driving, designed to dim oncoming car headlights or sharp reflections.The night glasses will enhance retina protection, keep you eye healthy and clear. And the lenses are scratch-proof, shatterproof. APPLICABLE SCENARIO - HD driving goggles and lightweight alloy design- Yellow Lens Glasses for Night Vision Lens is perfect for usage by motorcycle and cycling , driving, running, fishing,racing, skiing and climbing, trekking or other outdoor activities enthusiasts. Especially at rainy day / foggy / night. DURABLE FRAME - Metallic alloy is the most durable eyeglass frame material.These sunglasses were constructed using special design techniques in order to ensure lightweight and avoid breakage while engaging in sports and recreational activity. 100% RISK FREE PURCHASE - All RAYSUN Warfare Sunglasses comes with a 1 year warranty on frames and lens as well as a 30 Day Money Back Guarantee when purchased from authorized dealers. So if you are not completely happy with your purchase for whatever reason, let us know and we will provide you the best service!